Tearing out impression material is one area where we consistently notice dentists struggling. In our series on impression troubleshooting and the challenges that dentists may face in capturing something a lab can use, we’ve outlined six previous mistakes that can cause confusion and remake headaches. Dentists do not always understand what the lab considers as a barrier to a successful result. This is because they are not seeing the issues from the perspective of the ceramist. In the past, we’ve focused on the concept of clinical superiority, and what dentists can do in the practice to ensure that their preparation design yields a satisfactory outcome. Crowns and preps may be a significant part of the foundation of your dental practice’s approach to cosmetic and/or restorative dentistry, so we wanted to give an inside look into how to give yourself a leg up on any potentially time-consuming remake situations. This weeks troubleshooting challenge is simple in concept but difficult in execution. When you take the impression and there are spaces such as black triangles/furcations, the material flows into these and then becomes almost impossible to remove. This tricky process then leads to a challenging balance between reassuring the patient that the impression will not be permanently molded to their teeth and getting the impression out while maintaining a precise shape. The solution to tearing out is as unexpected as it is fairly ingenious. Dr. Lee Ann Brady has written at length about her approach. 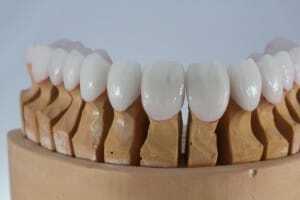 In her experience, Teflon tape is an easy and inexpensive material to use as a matrix for seating restorations. Get in the habit of checking for gingival embrasures/undercuts before taking the impression. Otherwise, everything that flowed between the teeth will be pulled out, leaving voids. This is unworkable for the lab and the impression will need to be re-taken. For instructions on how to best use Dr. Brady’s Teflon tape approach to tearing out, read her technique-oriented blog post. To really “think like a lab,” check out the first six impression challenges in our troubleshooting series.